The QNAP 24-Bay SAS NAS/iSCSI/IP-SAN Unified NAS Enclosure quickly takes care of your enterprise data storage needs by featuring two 10GbE SFP+ ports and 24 bays, which can house 12 Gb/s SAS- and 6 Gb/s SATA-based 3.5" or 2.5" drives. 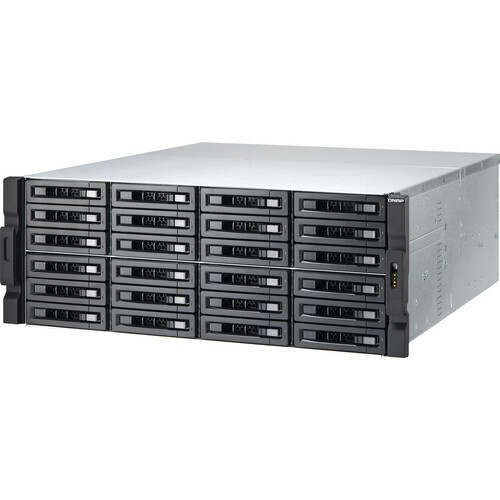 Once drives are installed, a quad-core 3.5 GHz Intel Xeon E3-1246 v3 processor and 16GB of DDR3 non-ECC memory run iSCSI and virtualization applications as well as the QTS operating system. You can configure your drives in a RAID 0, 1, 5, 6, or 10 mode to enhance the drive's reads and writes, while preserving data in the event a drive fails. To increase throughputs, QNAP has outfitted this enclosure with two 128GB mSATA modules set up for caching data. Additionally, four Gigabit Ethernet ports are on board to serve large numbers of simultaneous connections. Powering and cooling these features are accomplished with two redundant 650W PSUs and four 80mm fans. With a well-rounded set of backup solutions integrated, critical business information can be safely protected against unexpected data loss with real-time or scheduled data backups to a remote server. For safeguarding your data, this enclosure encrypts your data with FIPS 140-2 AES 256-bit encryption. It supports SMB/CIFS, NFS, and AFP protocols for file sharing across Windows, Mac, and Linux/UNIX networks. In addition, you can meet future data needs by cascading optional QNAP RAID expansion enclosures. 8. Bad Block Scan and Hard Drive S.M.A.R.T. Box Dimensions (LxWxH) 33.2 x 23.3 x 16.8"